On Sunday evening, EWG was featured on the latest episode of the E! show “Keeping Up With the Kardashians” – where Kourtney Kardashian joined the team in DC to lobby Congress for common sense cosmetics regulatory reform. One of the major reasons Kourtney came to the nation’s capital was that she feels parents shouldn’t have to worry about the products they use on their children every day. 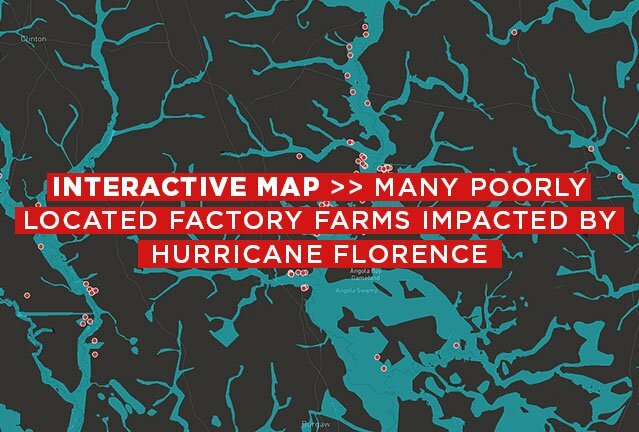 Later in the week, EWG published a joint analysis and map with our colleagues at Waterkeeper Alliance that detail the breadth of damage to industrial farming operations in North Carolina following September’s Hurricane Florence. We estimate that the storm flooded poultry operations housing 1.8 million birds, which became a public health risk to those living downstream. In the aftermath of last week’s bombshell National Climate Assessment, a report produced by 300 federal scientists across 13 agencies detailing the economic and environmental devastation expected in coming decades due to climate change, both Trump and his team worked overtime to cast doubt on these deeply troubling findings. Elsewhere in the Trump world, coal executive and cheerleader Robert Murray told Axios that the coal bailout he has championed since Trump entered office was not likely to happen. Saving the dying coal industry was one of President Trump’s key campaign promises during the 2016 election – but is now looking more and more like a massive deception. And finally, the holiday season is in full swing – so whether you’re staying home or traveling, EWG has got you covered. Over on our Children’s Health site, EWG pulled together some helpful tips for parents on road-tripping safely with mobile devices and improving air quality in one’s home when winter is in full swing. U.S. Department of Agriculture data obtained by the Washington non-profit Environmental Working Group shows the average payment for Wisconsin farmers from the Market Facilitation program is $2,145. The Journal Sentinel reports 11 farms received more than $50,000 each, while 237 farms got less than $100 and a few thousand more received an amount somewhere in between. USDA officials did not answer Reuters' questions about how many farmers have applied so far for the corn trade aid. But government data gathered by the Environmental Working Group, a Washington, D.C.-based lobby group, from public records requests shows the United States had paid farmers $1.9 million for 12,807 corn claims as of Oct. 31. The beleaguered sector was by far the biggest recipient of U.S. Department of Agriculture “market facilitation” payments to California, according to the data, released in response to a public records request from the Environmental Working Group, a longtime critic of farm subsidies. Like any program offering free money, there are also opportunities to game the system. On Monday, the watchdog organization Environmental Working Group released a report that shows city residents who own shares in farms and relatives of farmers have been capitalizing on the bailout and that some farmers appear to have been paid large sums of money. Washington Post: He’s an architect in Manhattan. He got $3,300 from Trump’s farm bailout. The Environmental Working Group, a critic of the bailout, released information on Monday about 87,704 bailout payments worth a total of $356 million. The transfers were made between September and the end of October. And while farmers are feeling the pain, President Trump is feeling the love. Support for the president has risen or remained steady in major farming states. Will farmers stick with the president after the harvest, if the breadbasket only gets crumbs? GUESTS: Scott Faber, Senior vice president for government affairs, Environmental Working Group; former vice president, the Grocery Manufacturers Association. We’re learning the first details of the Department of Agriculture’s bailout for farmers whose exports were hit by President Trump’s trade war. Department records show that more than 1,000 payments were made to “city slickers” who live in the nation’s largest cities, according to information the Environmental Working Group has obtained through a Freedom of Information Act request. The Environmental Working Group plans to release data on early recipients of USDA’s tariff-relief program, including names and dollar figures. “A $12 Billion Program to Help Farmers Stung by Trump’s Trade War Has Aided Few,” by NYT’s Alan Rappeport: “Like any program offering free money, there are also opportunities to game the system. On Monday, the watchdog organization Environmental Working Group is expected to release a report that shows city residents who own shares in farms and relatives of farmers have been capitalizing on the bailout. USDA records show that trade aid payments have been made to hundreds of people who live in urban areas. The Environmental Working Group said it’s evidence that the next farm bill should tighten payment limits for farm subsidies. Data from the Environmental Working Group showed about 100 of the nearly 4,300 trade relief payments from USDA to Iowa farmers through October were less than $25; some farmers hauled in $5 or less. The Des Moines Register has the story. The Environmental Working Group argued Monday that the data should prompt lawmakers working on a pending reauthorization of federal farm and nutrition programs to impose tougher standards to reduce the number of “city slickers” eligible for farm subsidies. The Environmental Working Group, a Washington, D.C.-based organization, reported that more than 1,000 people who live in the 50 largest cities in the United States got some of the nearly 88,000 payments the USDA had shipped out through the end of last month. The Environmental Working Group said the rescue program fails to help “the farmers most threatened by his escalating trade war.” The group said the top 10 percent of bailout recipients have received 68 percent of all the money. And 1,000 big city residents have gotten checks. The Environmental Working Group (EWG), a watchdog organization, found that 1,142 people in the country’s 50 largest cities received bailout payments from the Department of Agriculture. Nine residents of San Francisco, four residents of Los Angeles, five residents of New York City and four residents of Washington, D.C. received the funds, the report found. The USDA states that management must be "critical to the profitability of the farming operation," but according to the Environmental Working Group, a simple conference call can prove "active engagement" and almost a quarter of farm subsidy recipients do not physically work on the farm they receive subsidies for. The oldest sibling of the mega-famous clan admitted to viewers at the beginning of the episode that she wasn’t “the most political person” but said that having three kids made her more conscious of ingredients in products her family uses. To help her determine the safety of the contents, she said she uses an app from theEnvironmental Working Group, the nonprofit that invited her to Washington and is pushing for a revision of updated cosmetics testing laws. New York Magazine – The Cut: Kim Kardashian West Knows How to Party, Okay?! Just kidding, she's trying to make us all interesting to look at by joining forces with the Environmental Working Group to reform cosmetics laws in America. Reprinted by Yahoo! Lifestyle. A Thanksgiving Eve documentary about food, nutrition and health. Physicians and nutritionists discuss what we know about the ways a healthful diet can increase your long-term well-being. Some physicians are taking a more proactive approach guiding patients to make better food choices. As we begin to prepare a celebratory meal for tomorrow, a Humankind documentary explores the connection between diet and health. We hear from Scott Faber of the Environmental Working Group. “Given what we know about the president's reading habits, I wonder if the report has any pictures,” said Ken Cook, president of the Environmental Working Group, in response to Trump claiming he “read some of” the government's assessment. “Given what we know about the president’s reading habits, I wonder if the report has any pictures,” said Ken Cook, president of the Environmental Working Group, in response to Trump claiming he “read some of” the government’s assessment. “In normal times, a zealous fossil fuel apologist and the top official in charge of protecting children’s health from pollution would be two separate people with conflicting agendas,” said Ken Cook, president of the nonprofit Environmental Working Group. “But this is the Trump administration, where a former top coal lobbyist could become administrator of the EPA.” Reprinted by the San Francisco Chronicle and 115 more times. “In normal times, a zealous fossil fuel apologist and the top official in charge of protecting children’s health from pollution would be two separate people with conflicting agendas,” Ken Cook, president of the nonprofit Environmental Working Group, said in a statement. “But this is the Trump administration, where a former top coal lobbyist could become administrator of the EPA.” Reprinted by 336 media outlets. “Whether or not he’s confirmed by the Senate to be the next administrator, when [Mr] Wheeler’s time at EPA ends, more children will have been exposed to dangerous pollutants,” the Environmental Working Group (EWG) said. But environmental groups say that's not reason enough to give Dunn's nomination a rubber stamp. “She is clearly a better candidate for the job than Michael Dourson, but until she demonstrates a commitment to clean up the toxic mess left by her predecessors, I think the jury's out,” Scott Faber, vice president for government affairs at the Environmental Working Group, told ME. The heavy rains and high waters after Hurricane Florence flooded 35 industrial poultry operations in North Carolina housing an estimated 1.8 million birds, according to a new investigation by Waterkeeper Alliance and the Environmental Working Group (EWG). Reprint of EWG news release. "The best way for those in the affected areas in California to minimize health effects is to limit exposure to the contaminated air—a feat that is much easier said than done," says Nneka Leiba, director of the Environmental Working Group's healthy living science program. The U.S., meanwhile, has faced at least 510 reported cases of toxic blue-green algae since 2010, with 239 of these events occuring in the last year alone, according to the non-governmental organisation Environmental Working Group. Florida’s coastline is facing an additional threat from “red tide” algae, which has proven fatal to whale sharks, manatees and sea turtles. The Environmental Working Group, a Washington, D.C., based organization,highlighted 10 water utilities that encountered spikes in 2017. The others are in Illinois, Kansas and Ohio — all states with sizable agricultural operations. “Atrazine is a herbicide commonly detected in drinking water that comes from cornfield and other agricultural runoff. It is a hormone disrupter that harms the male and female reproductive systems of people and wildlife,” Environmental Working Group writes on its website. According to the Environmental Working Group, many dryer sheets are coated with chemicals, including quaternary ammonium compounds, which the Association of Occupational and Environmental Clinics calls asthmagens — substances that can cause asthma to develop in otherwise healthy people. Reprinted by The Cochrane Times-Post. The Kitchn: What Is Rinse Aid and Should You Be Using It? We also like Ecover Rinse Aid, which gets an A from the Environmental Working Group (EWG). USA Today: Goop and others profit by shunning makeup chemicals. What do scientists say? CSC and EWG point to formaldehyde’s designation as a known human carcinogen by the National Toxicology Program and say health concerns include cancer. For folks who want to get more involved in Beautycounter's advocacy efforts, their website offers a list of non-profit partners like Healthy Child Healthy World and the Environmental Working Group. The list complements a newsletter from the brand that highlights the behind-the-scenes work it is doing to reform the cosmetics industry in U.S., which has not passed a major federal law to regulate the safety of ingredients used in personal care products since 1938. I was washing my children with a natural foaming oatmeal body wash by a name brand, but when I went on the Environmental Working Group’s database, it rated it an eight out of nine for toxicity. I thought I was using natural oatmeal body wash, and in fact I was putting toxins on my babies. Shape: Are Semi-Permanent BB Cream Tattoos the Next Microblading? And the BB cream's ingredient list, translated from Russian, includes 4-methylbenzylidene camphor, which gets a high hazard rating from the Environmental Working Group. Even if you haven't jumped on the clean beauty bandwagon, you might want to think twice before embedding it into your skin. Planted in Beauty is Cosmos Cosmetic Standard certified, which falls under ECOCERT’s certification umbrella. They are also EWG verified, Leaping Bunny certified and Vegan certified. As if this were not enough, one percent of all their proceeds is donated to 1% For The Planet. In another recent study by the Environmental Working Group (EWG), all 28 samples of oat-based cereals tested were found to contain glyphosate. Some of the cereals found to include glyphosate include: Cheerios (multiple flavors), Quaker Oats (multiple flavors), Quaker Granola (multiple flavors) and Quaker snack bars (multiple flavors). Reprinted by Health Tips Blog. Let them know that you prefer foods without glyphosate residues — and are prepared to switch brands if necessary to find them. As Olga Naidenko, senior science adviser for children's health at the Environmental Working Group, told CNN, "We know it’s possible to grow oats and other grains without herbicides. Meat products are far and away the worst food products when it comes to the greenhouse gases stemming from their production, transportation and consumption,data from the Environmental Working Group found. Lamb is the worst culprit, causing 39.2 kilograms of carbon dioxide emissions for every kilogram eaten. Comparatively, lentils produce less than 1 kilogram of carbon dioxide for every kilogram eaten. See Meat Eater’s Guide to Climate Change + Health for more. “A number of current legal standards for pesticides in food and water do not fully protect public health, and do not reflect the latest science,” said Olga Naidenko, senior science advisor to the non-profit Environmental Working Group, which has issued several reports looking at potential dangers of pesticides in food and water. “Legal does not necessarily reflect “safe,” she said. Reprinted by Nation of Change. Well+Good: Wait, grocery store apples are HOW old?! This vampire-esque lifespan is partly because of chemicals used on apples before arriving in stores, says Alex Formuzis, the vice president of communications at the Environmental Working Group. “Unlike some other produce, insecticides and fungicides are both applied to apples,” Formuzis says—up to 16 different kinds of pesticides in all. A great stocking stuffer for active people who spend lots of time outdoors in the sun - in warm or cold weather. Beyond Coastal makes “active” and “natural” formula sunscreens, and all receive high ratings from the Environmental Working Group. “When companies are directly impacting downstream water and impacting health, I think the onus is on them to take action as fast as possible to stop ongoing contamination,” said David Andrews, a senior scientist at the Environmental Work Group. “The concerns that people have are reflective of the bigger issue which is how we regulate industrial chemicals in this country,” said David Andrews, a senior scientist with the Environmental Working Group. “We think much more could be done to protect drinking water sources.